SOUTH CAROLINA IS INVESTING $300 MILLION IN THE HARBOR DEEPENING PROJECT: Construction on the project will soon begin. SC Ports plan a record $262.3 million in capital investments for FY18. Key infrastructure projects at SC Ports include terminal updates, new terminal capacity, and a deeper harbor. SCPA and South Carolina are investing $2 billion to fulfill the requirements of today's big-ship environment. South Carolina Ports Authority president and CEO Jim Newsome focused on the port’s strategic plans for volume growth and infrastructure investment during the annual State of the Port last week. The Propeller Club of Charleston event marked Newsome’s ninth address since joining SCPA in 2009. He discussed the trends dominating today’s shipping industry and the benefits of a growing port to the state’s and region’s economy. SCPA volumes for the 2017 fiscal year, which ran July 2016 through June 2017, were strong across all business segments. The port handled a record 2.14 million TEU, an increase of 10 percent over the previous fiscal year. Approximately 23 percent of the port’s container cargo moved via intermodal rail, and Inland Port Greer achieved a record 120,000 rail moves in FY17. In the non-containerized cargo segment, 851,662 breakbulk pier tons moved across SCPA docks, including over 250,000 export finished vehicles. From a financial perspective, the port posted $80 million in operating cash flow and over $180 million in capital expenditures in FY17. The year was highlighted by significant progress of key port infrastructure projects. The Charleston Harbor Deepening Project to 52 feet was authorized and named a “new start” by the U.S. Army Corps of Engineers, allowing construction to begin this fall. At the Wando Welch Terminal, new 155-foot ship-to-shore cranes were commissioned, a refrigerated cargo service area opened, and the wharf modernization project is nearing completion. FY17 also marked a series of big ship calls, including the May 13 arrival of the COSCO Development, the first 13,000 TEU vessel to call East Coast ports. The Port celebrated its biggest ship call to date on September 14, when the 14,414 TEU CMA CGM Theodore Roosevelt docked at the Wando Welch Terminal. SCPA now routinely works 13,000-14,000 TEU vessels as part of the weekly OCEAN Alliance South Atlantic Express (SAX) service and expects to handle additional services with vessels of this size as early as next year. Looking ahead, Newsome expects fairly positive economic and industry fundamentals to support five percent container volume growth for SCPA. Strength of the U.S. consumer will sustain import volumes, and exports will be driven by the recovery of emerging market economies as well as foreign direct investments in manufacturing. 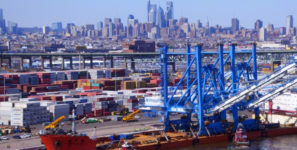 The port will strive to consistently deliver on key operational metrics, including gate turn times for truck drivers within one hour, ship-to-shore crane productivity above 35 moves per hour, a high performing rail drayage program, and just-in-sequence support of the region’s major manufacturers. A record $262.3 million capital investment plan in FY18 sets the stage for port to make significant progress on key projects, including terminal updates, new terminal capacity, a deeper harbor and a new headquarters. Longer term, SCPA and the State of South Carolina are investing more than $2 billion in port and port-related facilities by 2021 to fulfill the requirements of a modern port in today’s big-ship environment. The largest investment by the state is the harbor deepening project, for which the South Carolina General Assembly set aside $300 million in 2012. Construction on the project will soon begin, marking a historic accomplishment that will make Charleston the deepest harbor on the entire East Coast. The state’s financial partnership with the port also includes the dedicated access road off I-26 to the Leatherman Terminal and the commitment to construct a dual-served Navy Base Intermodal Facility pending the railroads’ agreement on economic terms and access. Hand-in-hand with the Port’s waterside infrastructure investments are improvements to inland connectivity to support intermodal rail volume growth. SCPA is developing plans for an inner-harbor barge to move containers between the Wando and Leatherman Terminals, which will reduce local truck traffic and utilize the Leatherman Terminal’s direct access to the future Navy Base Intermodal Facility. Inland Port Greer, as well as the opening of Inland Port Dillon in early 2018, will further enhance the Port’s rail volumes and connectivity to interior markets. Modern facilities and a deepwater harbor will enable the port to continue to play an integral role in economic development for South Carolina. As evidenced by investments by BMW, Michelin, Volvo, and Frontier Logistics, among many others, global businesses locate near ports.